Rich with antioxidants, this lightweight moisturizer drenches skin with organic aloe, organic coconut oil and jojoba oil, nourishing vitamin E , rosewater and rosemary. If your skin is thirsty for hydration, this refreshing moisturizer absolutely delivers. 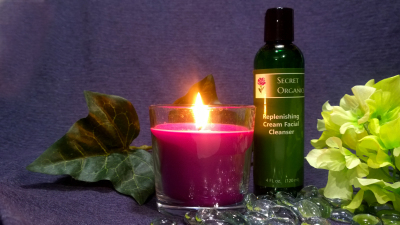 The soothing, cooling fragrance of fresh cucumbers, leaves your skin feeling soft and supple. This light, creamy cleanser features moisture enhancing ingredients that rid the skin of dirt without the need for lather or foam. This cleanser is packed full of vitamins A,C, B5 and E. Organic aloe and olive oil, organic lavender, white tea extracts gently cleanse, yet replenish, leaving your skin soft and silky. The fragrance of lavender and mint is extremely refreshing. 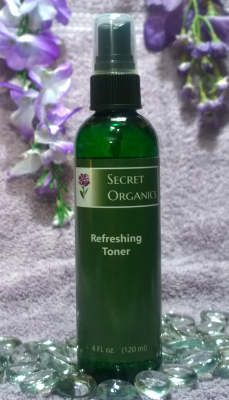 This refreshing toner is pH balancing which prepares the skin for serums and moisturizers. It refines and helps minimize the appearance of pores. 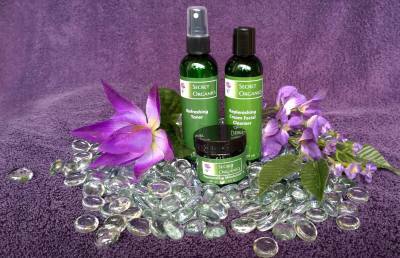 It features organic aloe leaf juice, rose distillate and tea tree essential oil. It is a must in your daily skin regime. ​Save money by ordering the entire package. The basics of at home skin care should always include a cleanser, toner and moisturzier. 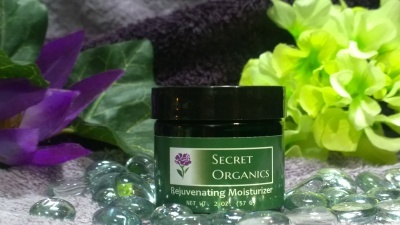 Secret Organics is a wonderful line to help you fall in love with your skin.